Since the Crisis, macroprudential policy has become a necessary complement to monetary policy. The ECB is striving to be a major contributor to the growing body of thought about the role and instruments of this new policy area. In this column, Vice-President Vítor Constâncio introduces the new bi-annual ECB Macroprudential Bulletin aimed at widening awareness about the Bank's macroprudential policy mandate, enhancing transparency, and informing about current ECB discussions and approaches in the field. Since the Crisis, macroprudential policy became a necessary complement to monetary policy. In my area of responsibility, we are striving to make the ECB a major contributor to the growing body of thought about the role and instruments of the new policy area. The first edition of the ECB Macroprudential Bulletin1 (“the Bulletin”) marks the starting point for regular (bi-annual) reporting on macroprudential policy with a focus on tools and models supporting that analysis. Three main objectives are being pursued by the ECB with the launch of this new bi-annual publication. First, to widen awareness about the ECB’s macroprudential policy mandate: a topical issue in this first Bulletin is a detailed explanation of the macroprudential policy framework and decision-making procedures at the ECB. Second, to enhance transparency about the ECB’s work on macroprudential policy: the Bulletin is a channel to divulge ongoing or recently published ECB research on analytical tools and models in the macroprudential policy area, intended for use in policy work. Main findings provide insights on current ECB thinking and inform views of decision-making bodies on macroprudential policy in constituencies taking part in the Single Supervisory Mechanism (SSM). Finally, to inform about current ECB discussions and approaches in the field of macroprudential and regulatory policy: beyond explaining ECB positions, the Bulletin provides an overview of recent announcements on macroprudential instruments adopted by national authorities. These have not been topped-up by the ECB following our regular assessment, including from the angle of possible spillovers to other countries. Macroprudential powers in the SSM area are shared between national authorities and the ECB. The SSM Regulation gives national authorities the power to implement macroprudential measures and provides the ECB with the power to tighten those measures that are set out in EU legislation. The ultimate decision-making body of the ECB is the Governing Council, which interacts closely with the SSM Supervisory Board on macroprudential matters. The Macroprudential Forum, composed of the members of the Governing Council and the SSM Supervisory Board, operates as a platform for regular discussions and exchange of views at the highest policy level, bringing together microprudential and macroprudential perspectives from across Europe. Macroprudential policy analyses are prepared by the Financial Stability Committee (FSC), which is composed of high-level representatives from the national central banks and supervisory authorities of the SSM countries and the ECB. Analytical tools and models described in the Bulletin may support one or more of the following steps: a) identification and analysis of main risks and vulnerabilities, b) selection and calibration of instruments, c) assessment and choice of policy option, d) monitoring effectiveness of implemented policy. The next sections introduce three analytical and research tools presented in the first edition of the Bulletin. In order to provide a quantitative assessment of the role of capital-based macroprudential policies in SSM countries, the ECB is building on the model developed by Clerc et al. (2015) as part of the work undertaken by the European System of Central Banks’ Macroprudential Research Network (MaRs). The model provides a clear rationale for capital regulation in a general equilibrium framework where banks, households and non-financial corporations can default. It demonstrates how capital regulation arises as a welfare-improving response to two types of distortion: the limited liability of banks, and the cost externalities of bank funding. Both distortions can lead to excessive risk taking by banks. Higher capital ratios reduce incentives to take on excessive leverage and can thereby tighten banks’ supply of loans. At the same time, higher capital ratios reduce bank defaults and thus the cost of uninsured funds provided to banks, which in turn reduces the cost of credit. The optimal level of capital requirements is thus one that balances the costs linked to more expensive equity funding with the benefits of a lower rate of bank defaults. For application in policy work, this tool is being developed for use at Eurozone level – by calibrating the model3 to match features of euro area aggregate macroeconomic and financial variables – and at country-specific level. The results show that GDP, household consumption and borrowers’ welfare first increase and then decrease as the capital ratio increases, thus highlighting the importance of correctly taking into account the starting point when assessing the effects of a policy measure. Additional macroprudential instruments will be added to the framework for impact assessment analysis. The ECB has developed a model of the Eurozone household sector. It is a first prototype of an integrated micro-macro model that supports the top-down stress testing function and can be used for assessing the efficacy of borrower-based macroprudential instruments, e.g. loan-to-value (LTV) ratio and debt-service-to-income (DSTI) ratio caps.4 The model framework allows the ECB to quantify both the impact on banks’ capital positions as well as the macroeconomic feedback effects resulting from the policy-induced reduction of demand for mortgage loans. The model has two core components – a macro part and a micro part. The macro component uses a global vector autoregressive (GVAR) model structure to capture the dependencies of variables that shape the size and structure of household balance sheets over time: house prices, short- and long-term interest rates and stock prices. It furthermore contains country-level unemployment rates which also provide an important input for the micro part of the model. The micro component is built around a household member-level logistic model for their employment status, which along with other inputs is sourced from the Household Survey.5 The dependency between the evolution of income, asset prices and employment rates over the business cycle needs to be captured accurately in the fully integrated macro and micro components. Early and accurate identification of risks is an essential first step in the process of setting macroprudential policy, a policy area with a clear pre-emptive scope. The ECB has developed a bank early warning model (BEWM) that can be used to identify both vulnerabilities in individual systemically important banks and vulnerabilities that build up simultaneously across a number of banks at the country or Eurozone level (see Figure 1). Notes: The aggregate distress probability is obtained from the bank early warning model (BEWM). The model is estimated for a large number of euro area banks and builds on the method and dataset described in Lang, Peltonen and Sarlin (2015) – “A Framework for Early Warning Modelling with an Application to Banks” (forthcoming ECB Working Paper). The BEWM is built around a bank-level logit model that uses bank-specific, aggregate banking-sector and macro-financial indicators as predictive variables to warn off future bank distress (bankruptcies, defaults, liquidations, state-aid cases and distressed mergers). The model is based on the method and dataset described in Lang et al. (2015),7 applied to Eurozone banks. The optimal signalling threshold for the logit model probabilities is derived by maximising the usefulness of the model for a policy-maker that cares about Type I errors (missed bank distress events) and Type II errors (false bank distress alarms). Eleven risk-drivers are identified as optimal predictors for bank distress over a two-year horizon – five bank-specific variables: bank leverage, asset quality, funding costs, profitability and trading activities; four banking-sector indicators: banking sector size, change in the loan-to-deposit ratio, level of and change in the share of market-based funding; and two macro-financial variables: developments in residential real estate prices and government bond yields. 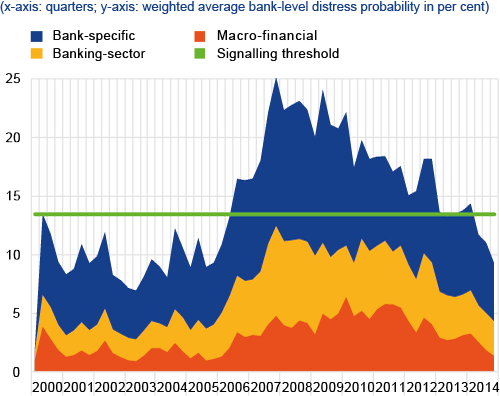 Aggregate Eurozone and country-level bank distress probabilities can be calculated as a weighted average of the relevant individual bank distress probabilities. In addition, decompositions of distress probabilities into contributing factors can help to identify which factors drive the build-up of vulnerabilities. The model performance in foreseeing banks’ vulnerabilities in past data makes it useful to provide a micro view on the build-up of vulnerabilities, and support macroprudential policy analysis. The next edition of the Bulletin will be published in September and will cover components of macroprudential stress tests. See ECB webpage, https://www.ecb.europa.eu/pub/pdf/other/ecbmpbu201603.en.pdf; contact [email protected] for a subscription the Bulletin’s mailing list. The next edition of the Bulletin will be published in September. Clerc, L., A. Derviz, C. Mendicino, S. Moyen, K. Nikolov, L. Stracca, J. Suarez and A.P. Vardoulakis, 2015, “Capital regulation in a macroeconomic model with three layers of default”, International Journal of Central Banking, Vol. 11, No 3, pp. 9–63. Mendicino, C., N. Kalin, J. Suarez and D. Supera, 2015, “Welfare Analysis of Implementable Macroprudential Policy Rules: Heterogeneity and Trade-offs”, forthcoming ECB Working Paper. See ECB Working Paper No. 1881, “Assessing the efficacy of borrower-based macroprudential policy using an integrated micro-macro model for European households” by M. Gross and J. Poblacion. Lang, J.H., T. Peltonen and P. Sarlin, 2015, “A framework for early-warning modelling with an application to banks”, forthcoming ECB Working Paper.